You might think that a smaller space might limit what you can do to make it your own, but you can still personalize your small apartment in a big way with creative interior design. With these decorating tips on hand, you will be more than ready to transform your small space into the a homey apartment that feels spacious and one hundred percent your own. Just because you have a small apartment doesn’t mean it has to be boring! The vast majority of apartments are box-shaped, so adding curves with strategic furniture placement adds visual interest and a distinct sense of personality to any small space. Round tables and chairs with modern curves can spice up your space. Rugs in interesting shapes or have shapes on them like spirals and dots are excellent home decor for any small apartment. 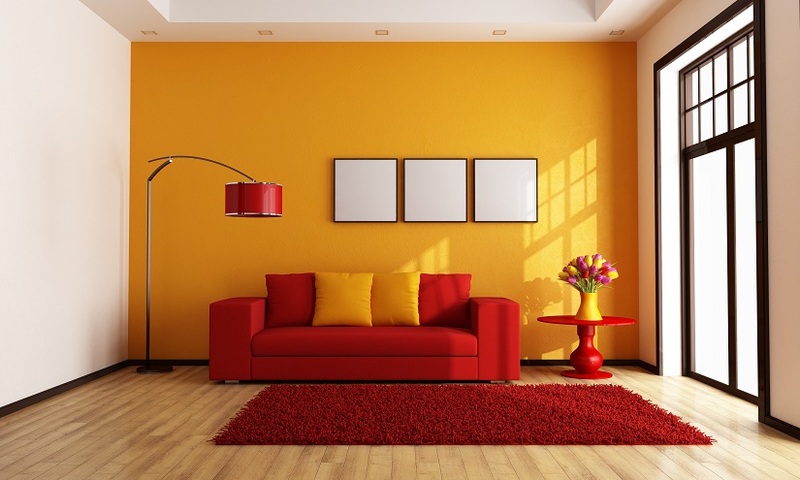 Dark colors make spaces look smaller, and light colors can make them look larger and airier. If your apartment came with dark stained floors and or carpeting, and it’s making you feel claustrophobic, covering that up with a carpet in a lighter shade will appear to instantly add square footage to your small apartment. A small space can benefit from the luxurious look of layered linens and fabrics. Layering in this way adds an elegant mix of patterns, textures, and colors to what is always one of the biggest pieces in any apartment. If you don’t have a lot of excess space to show your flair, spending extra time on seemingly simple centerpieces will make your home decor pop! Cramming large pieces of furniture into a small space will only overwhelm your decor, and make it look clunky and crowded. Apartments with appropriately sized furniture look bigger and more cohesive. Take the size of your space into mind when choosing pieces. A giant dramatic chair or sofa is not the right choice if you haven’t got the room for it. Lighting can help you make the most of any small space. Dark, dimly lit spaces look cramped and uninviting while well-lit spaces look open and warm. Strategic lights placed in multiple positions throughout a room create visual interest and add a lovely warm glow. The lights can also double as decorative pieces, providing visual interest while being a necessity of any room. At The Apartments of Wildewood, located in beautiful in St. Mary’s Maryland, we offer homes with access to pools, an on-site gym, and maintenance whenever you need it – and have access to all the information you need to affordably rent the perfect apartment. To set up an appointment to check out an apartment rental, call us at 301.737.0737 or visit the website! For more decorating tips and info about renting with Wildewood, check out our Facebook, Twitter, Pinterest, Google+, or LinkedIn. This entry was posted on Thursday, December 10th, 2015	at 8:05 pm	. Both comments and pings are currently closed.